The first race weekend of the season is always an exciting time. We had made some upgrades to the car over the off-season including a new seat and custom foam insert from our partners at ButlerBuilt. I had also been working on my mental preparation and looking over my video/data to plan out my test sessions for the weekend and target specific corners and areas for improvement. Arriving at the track early Friday morning we were greeted by a great sunrise, cool weather and spring greenery. First session out was dedicated to a shakedown of the car, checking over all the systems and ensuring we had resolved the clutch slipping issue. During the off-season with the help of CSR Performance we had pulled the motor and transmission to inspect the Clutch, Pressure Plate and Flywheel taking all the necessary measurements. We had to shim the pressure plate assembly and increase the throw of the clutch pedal due to the oversized thickness of the new sprung hub clutch. 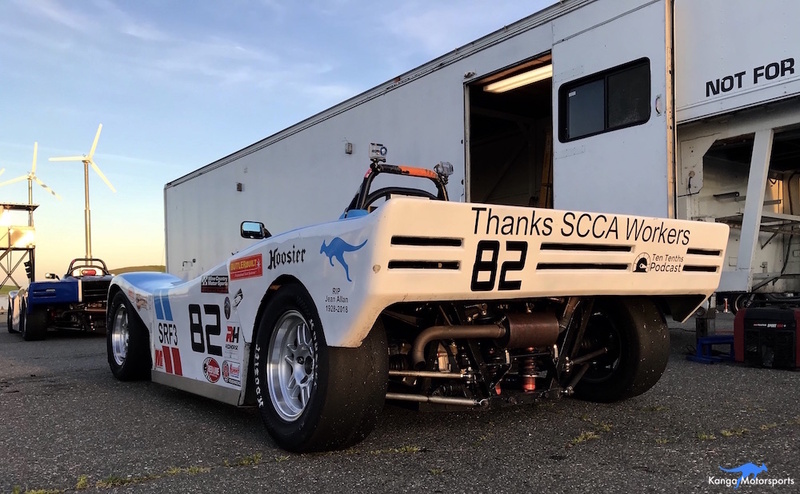 The car ran great and I was able to quickly get up to speed without any of the clutch slip we had experienced at the 2018 SCCA Runoffs. After a splash of fuel and short check over the car, we were back out on track. The session was cut short with black flags due to a stranded car. I had also overfilled the clutch master cylinder and unfortunately the fluid leaked onto the clutch pedal below, so I came in to avoid my foot slipping off the pedal. A quick clean up and everything was back together. The next session I focused on feeling the car and working on Turn 1 and 6. The new ButlerBuilt seat and foam insert custom molded to my body really helped as I was firmly held in place without any sliding around. I could really feel what the car was doing underneath me. Unfortunately with all the traffic coming in and out of the hot pits I only got two clear laps to work on Turn 1. During the morning I was having trouble with rear end grip. I was at full soft on the sway bar so made a change to stiffen the rear sway bar and it helped. Unfortunately the session after lunch ended early with a Red Flag as one of the GT cars had blown a motor dropping oil that caught fire on the hot exhaust header. The 4th session out on track, I decided to dedicate to just having fun! Perfect timing as the track was crowded and so I had some good opportunities to practice off-line passes and driving different racing lines around other cars. The safety belts had expired at the end of last season, the FIA belts are date coded to 5 years after manufacture. With the new belts in the car I needed to get the annual Tech Inspection done on the car. Thanks to George and the Tech Crew for getting me through the process quickly in time for the last session of the day. I also had my gear signed off and got my new helmet sticker, Blue for 2019. The last session of the day I focused on a couple of turns trying different types of corner entry and saw improvements in the sector times. At the end of the day I went through the car with my checklist and swapped out the worn out test tires for some fresher rubber. Good thing too as I had corded one of the rear tires during the very last session. With the car sorted it was time to get some food, review my data/video and get some rest ahead of the race weekend. The opening practice session was short but I was able to put in a decent time of 2:01.545. Enough to be 4th fastest in practice although several competitors did not run the practice session. My target for the race weekend was to get into the sub two minute lap times. I drove over to the Tech scales to check the car weight and we were over the minimum required by the rules. Returning to my paddock, I added the needed fuel we would burn during the qualifying session to make sure we made weight when we came off the track. With such a big field of ~30 cars getting enough space for some clear track time was going to be key to qualifying well. As the session progressed I got faster but then caught traffic and backed off to give myself a gap and try to get another flyer in before the checkered flag. I qualified 8th of 29 cars with a time of 2:00.826 just beating the #36 Red/Yellow of Randy McAyeal by 0.002 of a second on my very last lap. Big thank you to our friend Craig Hensley who showed up to cheer us on for Race 1 of the weekend wearing his new Kanga Gear. I got a decent start maintaining position and attempting to keep up with the fast pack of cars at the front. On lap 3, Yellow Flags came out and we restarted after a lap behind the safety car. I passed 3 cars on the restart after one spun on the outside of Turn 1 and another overshot Turn 5. I settled down and put in some fast laps to try and gap the rest of the field behind me. I couldn’t quite catch the lead group but was fast enough to keep them in sight. On the closing laps I had a great battle with the Orange #22 of John MacIntyre as he caught back up after his off in Turn 5. I would pull away in certain areas of the track and then he would gain in other areas. But on the final lap I managed to stay just ahead of him and took the checkered flag for a Top 5 finish. All the off-season work had paid off. After the race we quickly checked over the car and made sure it was ready for qualifying in the morning. I also gave the car a quick clean as it was covered in rubber and bugs after the race. Heading out on track for qualifying I partnered up with Bob Breton in the Black/White #51 and we switched back and forth so each of us could get a draft down the front and back straights and also see where the other was faster. I was able to set some sub two minute laps half way through the session. The best I could manage was a 1:59.911 enough to qualify me in 9th place for Race 2. With the great result from Race 1 and some fast times in qualifying I was excited for the final race of the weekend. Race 2 was more chaotic, the opening lap didn’t even finish before the red flag came out in Turn 14. An incident in Turn 4 caused damage with 10+ cars stricken out on track with busted radiators, smashed bodywork and torn suspension rendering them unable to continue. After what seemed like a long time sitting in the hot sun the restart came and I unfortunately dropped back to 10th. One lap later I made my way up to 9th with an inside pass under braking going into Turn 14 and then another pass for 8th place drafting down the front straight and going inside for Turn 1. I then put in some fast laps and was able to catch back up to the lead group. Chasing down the White #7 of Bill Jordan, I got a great run out of Turn 6 and made the pass on the inside of the uphill blind Turn 9, now in up to 7th position. Dropping to 8th a lap later as a fast charging Grey #11 Bob Sachs passed me on the inside under braking into Turn 14. I tried to hang onto the lead pack just ahead. On the 9th lap I put a rear wheel off on the entry to Turn 10 and spun dropping to 13th place. I spent the remaining few laps chasing down the cars that had passed me to regain positions. I made a pass on the outside of Turn 2, bringing me back to 12th place. Then another incident in Turn 5 left a car stranded and I narrowly avoided them cresting the hill. Unfortunately another car didn’t have anywhere to go and they collided damaging another two cars. I finished the race in 11th, surviving the carnage and setting some fantastic lap times. At the end of the race the track and impound was filled with stranded cars. I stayed back and helped two racers put corners on their cars so we could push them into their trailers. We then loaded up the CSR Performance trailer and headed home. Thank you to all our Sponsors and Partners. Thanks to BulterBuilt for the fantastic new seat and custom foam insert that really kept me very secure. Big thank you to all the SCCA Workers and Volunteers for a fantastic event, they had their work cut out for them with multiple racing incidents throughout the weekend. A long but great weekend of racing. I had some real pace and made a lot of great passes despite my mistake in Race 2. The work over the off-season really helped and I am now looking forward to the next event, Races 3 & 4 from this historic WeatherTech Raceway Laguna Seca, 6-7 April 2019. Want to hear more great race weekend stories? Or catch up on the latest racer or tech tips. Sign up the Kanga Motorsports Newsletter. Sign up to receive all the latest race reports, tech articles and news direct to your inbox.